^ a b c d e f g h i j k l m Whitehorn, J; Farrar, J (2010). “Dengue”. British Medical Bulletin 95: 161–73. doi:10.1093/bmb/ldq019. PMID 20616106. ^ a b c d e f g WHO (2009), pp. 14–16. ^ a b c d Reiter, P (2010-03-11). “Yellow fever and dengue: a threat to Europe?”. Eurosurveillance 15 (10): 19509. PMID 20403310. http://www.eurosurveillance.org/ViewArticle.aspx?ArticleId=19509. ^ a b c d e f g h i j k l m n o p q r s t u v w x y z aa Ranjit, S; Kissoon, N (July 2010). “Dengue hemorrhagic fever and shock syndromes”. Pediatric Critical Care Medicine 12 (1): 90–100. doi:10.1097/PCC.0b013e3181e911a7. PMID 20639791. ^ a b c d e f Varatharaj, A (2010). “Encephalitis in the clinical spectrum of dengue infection”. Neurology India 58 (4): 585–91. doi:10.4103/0028-3886.68655. PMID 20739797. http://www.neurologyindia.com/article.asp?issn=0028-3886;year=2010;volume=58;issue=4;spage=585;epage=591;aulast=Varatharaj. ^ a b c d e f Simmons, CP; Farrar, JJ; Nguyen van Vinh, C; Wills, B (April 2012). “Dengue”. New England Journal of Medicine 366 (15): 1423–32. doi:10.1056/NEJMra1110265. PMID 22494122. ^ a b c d e f g h i Chen, LH; Wilson, ME (October 2010). “Dengue and chikungunya infections in travelers”. Current Opinion in Infectious Diseases 23 (5): 438–44. doi:10.1097/QCO.0b013e32833c1d16. PMID 20581669. ^ WHO (2009), pp. 25–27. ^ a b Wolff K, Johnson RA, ed (2009). “Viral infections of skin and mucosa”. Fitzpatrick's color atlas and synopsis of clinical dermatology (6th ed.). New York: McGraw-Hill Medical. pp. 810–2. ISBN 978-0-07-159975-7. ^ a b Knoop KJ, Stack LB, Storrow A, Thurman RJ, ed (2010). “Tropical medicine”. Atlas of emergency medicine (3rd ed.). New York: McGraw-Hill Professional. pp. 658–9. ISBN 0-07-149618-1. ^ a b c d e f Gould, EA; Solomon, T (February 2008). “Pathogenic flaviviruses”. The Lancet 371 (9611): 500–9. doi:10.1016/S0140-6736(08)60238-X. PMID 18262042. ^ a b c d e f g h i j Rodenhuis-Zybert, IA; Wilschut, J; Smit, JM (August 2010). “Dengue virus life cycle: viral and host factors modulating infectivity”. Cellular and Molecular Life Science 67 (16): 2773–86. doi:10.1007/s00018-010-0357-z. PMID 20372965. ^ a b c d e f g h i j k l m Guzman, MG; Halstead, SB; Artsob, H; et al. (December 2010). “Dengue: a continuing global threat”. Nature Reviews Microbiology 8 (12 Suppl): S7–S16. doi:10.1038/nrmicro2460. PMID 21079655. http://www.nature.com/nrmicro/journal/v8/n12_supp/full/nrmicro2460.html. ^ Buckner EA, Alto BW, Lounibos LP. 2013 Vertical transmission of Key West dengue-1 virus by Aedes aegypti and Aedes albopictus (Diptera: Culicidae) mosquitoes from Florida. J Med Entomol. pp 1291-1297. ^ Wilder-Smith, A; Chen, LH; Massad, E; Wilson, ME (January 2009). “Threat of dengue to blood safety in dengue-endemic countries”. Emerging Infectious Diseases 15 (1): 8–11. doi:10.3201/eid1501.071097. PMC: 2660677. PMID 19116042. http://www.cdc.gov/eid/content/15/1/8.htm. ^ Stramer, SL; Hollinger, FB; Katz, LM; et al. (August 2009). “Emerging infectious disease agents and their potential threat to transfusion safety”. Transfusion 49 Suppl 2: 1S–29S. doi:10.1111/j.1537-2995.2009.02279.x. PMID 19686562. ^ Teo, D; Ng, LC; Lam, S (April 2009). “Is dengue a threat to the blood supply?”. Transfusion Medicine 19 (2): 66–77. doi:10.1111/j.1365-3148.2009.00916.x. PMC: 2713854. PMID 19392949. http://onlinelibrary.wiley.com/doi/10.1111/j.1365-3148.2009.00916.x/full. ^ Wiwanitkit, V (January 2010). “Unusual mode of transmission of dengue”. Journal of Infection in Developing Countries 4 (1): 51–4. PMID 20130380. http://www.jidc.org/index.php/journal/article/view/20130380. ^ a b c d e Martina, BE; Koraka, P; Osterhaus, AD (October 2009). “Dengue virus pathogenesis: an integrated view”. Clinical Microbiology Reviews 22 (4): 564–81. doi:10.1128/CMR.00035-09. PMC: 2772360. PMID 19822889. http://cmr.asm.org/cgi/content/full/22/4/564. ^ a b c d e f g h WHO (2009), pp. 10–11. ^ Simmons, CP; Farrar, JJ; Chau, NvV; Wills, B (2012-04-12). “Dengue”. The New England Journal of Medicine 366 (15): 1423–32. doi:10.1056/NEJMra1110265. PMID 22494122. ^ a b c WHO (1997). “Chapter 2: clinical diagnosis”. Dengue haemorrhagic fever: diagnosis, treatment, prevention and control (2nd ed.). Geneva: World Health Organization. pp. 12–23. ISBN 92-4-154500-3. http://www.who.int/csr/resources/publications/dengue/012-23.pdf. ^ a b Gubler (2010), p. 380. ^ a b WHO (2009), p. 137. ^ a b c Barrett, AD; Stanberry, LR (2009). Vaccines for biodefense and emerging and neglected diseases. San Diego: Academic. pp. 287–323. ISBN 0-12-369408-6. http://books.google.co.uk/books?id=6Nu058ZNa1MC&pg=PA289. ^ Gubler (2010), pp. 376. ^ a b Gubler (2010), pp. 377. ^ 世界におけるデング熱・デング出血熱. 25. 国立感染症研究所. pp. 33-34. http://idsc.nih.go.jp/iasr/25/288/dj2886.html. ^ a b Anonymous (2006). “Etymologia: dengue”. 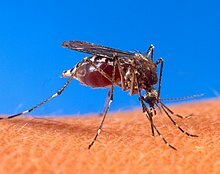 Emerging Infectious Diseases 12 (6): 893. http://www.cdc.gov/ncidod/eid/vol12no06/pdfs/etymology.pdf. ^ a b c d Gubler, DJ (July 1998). “Dengue and dengue hemorrhagic fever”. Clinical Microbiological Reviews 11 (3): 480–96. PMC: 88892. PMID 9665979. http://cmr.asm.org/cgi/content/full/11/3/480. ^ a b Henchal, EA; Putnak, JR (October 1990). “The dengue viruses”. Clinical Microbiology Reviews 3 (4): 376–96. doi:10.1128/CMR.3.4.376. PMC: 358169. PMID 2224837. http://cmr.asm.org/cgi/reprint/3/4/376. ^ a b c d Halstead, SB (2008). Dengue (Tropical Medicine: Science and Practice). River Edge, N.J.: Imperial College Press. pp. 1–10. ISBN 1-84816-228-6. http://books.google.com/books?id=6zLd9mFwxwsC&pg=PA1. ^ Rush, AB (1789). “An account of the bilious remitting fever, as it appeared in Philadelphia in the summer and autumn of the year 1780”. Medical enquiries and observations. Philadelphia: Prichard and Hall. pp. 104–117. ^ WHO (2009) p. 137–146. ^ a b c Webster, DP; Farrar, J; Rowland-Jones, S (November 2009). “Progress towards a dengue vaccine”. Lancet Infect Dis 9 (11): 678–87. doi:10.1016/S1473-3099(09)70254-3. PMID 19850226. ^ a b Sampath, A; Padmanabhan, R (January 2009). “Molecular targets for flavivirus drug discovery”. Antiviral Ressearch 81 (1): 6–15. doi:10.1016/j.antiviral.2008.08.004. PMC: 2647018. PMID 18796313. https://www.ncbi.nlm.nih.gov/pmc/articles/PMC2647018/. ^ a b Noble CG, Chen YL, Dong H, et al. (March 2010). “Strategies for development of Dengue virus inhibitors”. Antiviral Ressearch 85 (3): 450–62. doi:10.1016/j.antiviral.2009.12.011. PMID 20060421. ^ Tomlinson, SM; Malmstrom, RD; Watowich, SJ (June 2009). “New approaches to structure-based discovery of dengue protease inhibitors”. Infectious Disorders Drug Targets 9 (3): 327–43. PMID 19519486. Gubler DJ (2010). “Dengue viruses”. In Mahy BWJ, Van Regenmortel MHV. Desk Encyclopedia of Human and Medical Virology. Boston: Academic Press. pp. 372–82. ISBN 0-12-375147-0. http://books.google.com/books?id=nsh48WKIbhQC&pg=PA372. WHO (2009). Dengue Guidelines for Diagnosis, Treatment, Prevention and Control. Geneva: World Health Organization. ISBN 92-4-154787-1. http://whqlibdoc.who.int/publications/2009/9789241547871_eng.pdf. Buckner EA, Alto BW, Lounibos LP. 2013 Vertical transmission of Key West dengue-1 virus by Aedes aegypti and Aedes albopictus (Diptera: Culicidae) mosquitoes from Florida. J Med Entomol. pp 1291-1297.